Occasionally in life we need a test. Not just a high school algebra exam, but other major life events like welcoming a new family member or losing one's job. Tests are designed to show us whether we are prepared to handle future scenarios both physically and mentally. Tests are there to show us our limits. Most people avoid tests. Regardless of the excuse, it comes down to anxiety; the fear of failure or lack of preparedness. When we do poorly on a test, our limits have been revealed. We are shown that we are human. Pulling my car into the gate at a little past 3:00pm on Thursday, August 10th, Jim extended warm greetings and offered assistance in preparing my gear. The city of Ketchum provides free, secured, long-term vehicle storage at the water treatment facility on the south side of town. Months earlier, I had contacted Greg from the city police, who informed me that the only requirement was a signed release. Jim, along with the rest of the utilities crew, were also avid cyclists. They had seen their share of tourists come through and were anxious to try a tour for themselves. After witnessing the valley's bike foundation first-hand, I don't see how anyone in the area could not want to ride everywhere they went. The town is littered in dedicated lanes, paths, and street crossings. In fact, I was able to ride one of those paths from outside the facility gates until it turned into a dirt trail outside of town. Not once, in my entire time in Ketchum, did my tires exit a dedicated bike area. Needless to say, it was nice start. Most of my gear was already prepared from a shakedown ride last weekend, so little more than strapping bags to Smokey was all that was necessary in the parking lot. I was out by 4:00pm. The dirt trail is known as Harriman Trail. 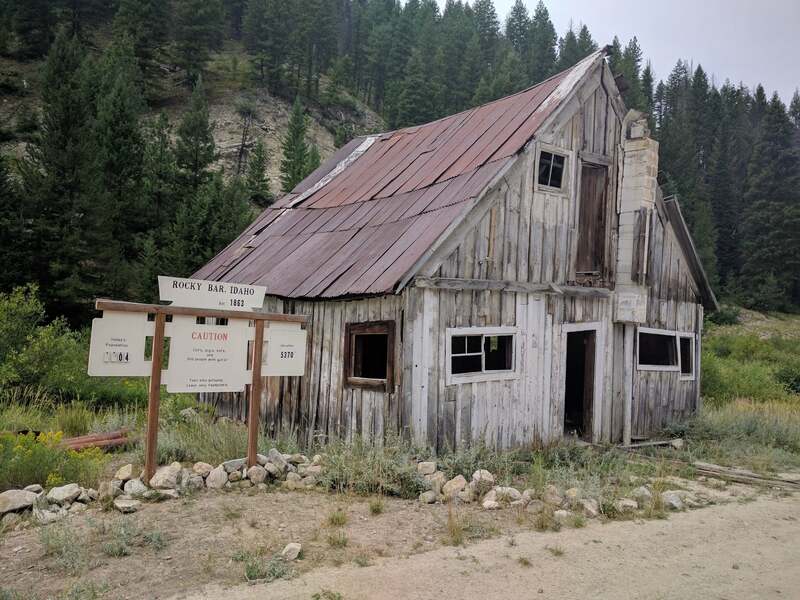 It extends from the Ketchum city limits nearly twenty miles until it turns into Gelena Lodge cross country ski trails. Unfortunately, several portions of the trail were completely washed out, possibly due to a wetter than average Spring. Occasionally, I had to ride the nearby highway until the trail was reasonably clear again. Gelena Lodge flew by after only a couple of hours, even though the ride thus far was entirely uphill. But, the excitement of starting an adventure came to an abrupt halt when I came to the realization that route finding based solely on a map, compass, and basic cyclometer was going to be more difficult than I had expected. Without a more precise current position, it was near impossible to find certain trails, especially when the maps are based on outdated information. Like they say, hindsight is 20/20. All I could do was push forward and make do the best I could. Gelena summit was just ahead. The first (half) day was a mixture of adrenaline and confusion. Just under 3000 feet of climbing, I set up camp on the other side of the summit just after night fall, 9:30pm. The strangest sound made me jump from bed last night. I was camped roughly 100 feet from the trail, and it sounded like a team of horses were systematically dragging a dead body up the hill. But it was past as quickly as it had come. Utterly perplexed, I brushed it off as a motorcycle in desperate need of a tuneup. It probably didn't pose any danger. The worst it could have been was a pack of squirrels ripping into my food bag hanging in a distant tree. Besides, I had my bear spray within arm's reach. Rising with the sun at 6:00am, the surrounding area was undisturbed. There were no signs of struggle on the trail, and my food bag was intact. The only thing that caught my eye was the beauty of the Sawtooth range just barely visible under a blanket of wildfire smoke. Drink some coffee, brush the teeth, and hit the trail again by 7:00am. It's my way. Is that the way home? Just like the day before, route finding is proving to be a chore. I'm putting on several more miles than I intended simply due to backtracking and guess work. Many of the trails out here are newer. 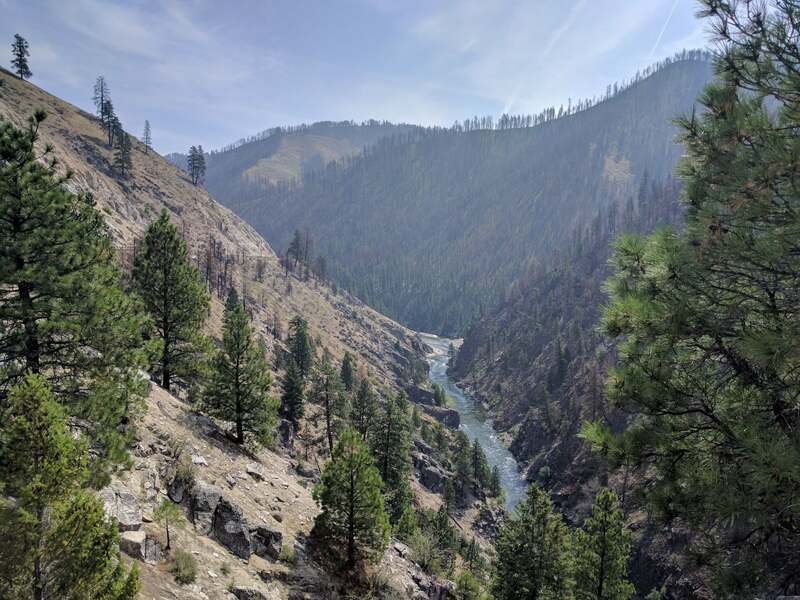 Like Bozeman, this area is booming in tourism and luxury “second homes”, with the added benefit of improved trail systems through the wilderness. My maps are worthless when I find that I'm on a trail that shouldn't even exist. Fortunately, I keep my head on straight and am able to progress, albeit slower than I had hoped. A couple hours into the morning, I come up behind a woman walking her dog. It's the first person I see all day and she obviously wasn't expecting to see me either. It startles her when I call out from behind that I'm about to pass. Because I haven't had a rough enough morning already, her dog freaks out. I've unintentionally trained myself into thinking all dogs like to wag their tail and give sloppy kisses. This was not one of those dogs. This was a dog that likes to protect his human. A dog that only sees a big, scary, mushroom-hatted man who intends to harm his human. A dog that is on a leash that is much too long for his human to control given the current situation. The dog is not to blame as he lunges at me. The fully loaded bike is clumsy and pulls me sideways as I attempt to jump away. I come crashing to the ground atop a spiny sagebrush as the woman gains control of her pet. I stumble on forward with nothing more said between the woman and I than simple apologies, her scolding the proud dog. The dog that protected his human. Not 24 hours into my trip and already digging into my first-aid kit. Just a small cut on the finger from the fall. Already weary by 10:30am, I come to a highway crossing and look down to realize I've lost a water bottle. 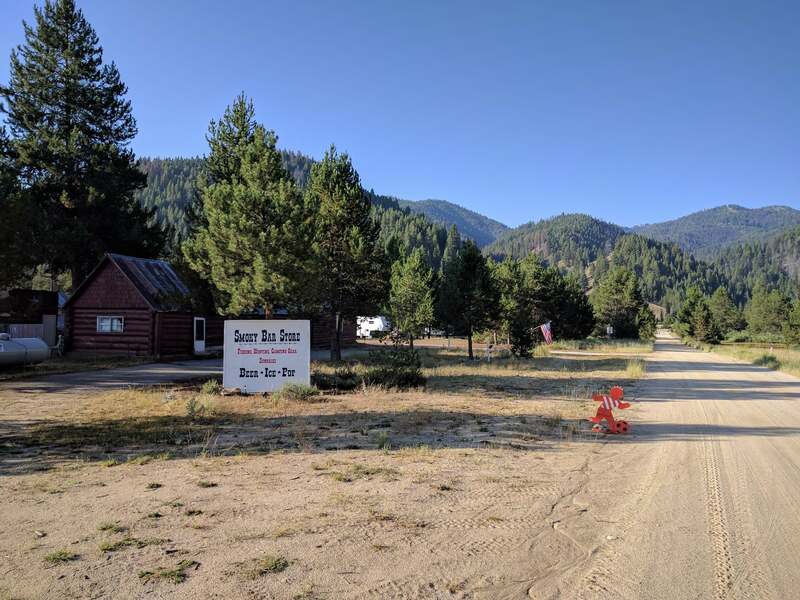 Taken as a sign, a twelve mile deviation from the planned route is twelve miles of flat, paved, beautiful country riding next to the spectacular Sawtooth mountains. I arrive at Stanley by 11:30am. A Reuben sandwich on homemade bread with homemade sauerkraut, a side of hash browns, and a chocolate chip cookie. Stanley Baking Company knows how to replenish the soul. Found a replacement water bottle at a sporting goods store and restocked the food supply at the grocers. Back on the road at 2:00pm. Things are looking up. I'm feeling great and the legs are moving well. A bit of a climb this afternoon and some clouds are rolling in to provide some relief from the heat. It flies within feet of the gravel camping access road! Some sort of crane, maybe? A larger bird of some sort, making a sound much louder than it appeared to be able to make. It's expansive wings beating the air like the hooves of horses upon the ground. Route finding becoming a bit easier and a few rain showers to clear away the smoke, I'm stopped at an intersection for a quick break when I see another bikepacker coming down the road. Kaitlyn is doing a section of the Smoke and Fire route, which shares many of the same sections as the ACA route. Not only is she a force on the trails (admiring her Strava profile), but she teaches Adventure Education courses at a small Arizona college, and is a Salsa sponsored rider. She points out that we're both riding a Woodsmoke! As much as I had enjoyed the company, it couldn't last long. Kaitlyn and I parted ways a few miles down the road, not only because our routes diverged, but because my legs simply couldn't keep up. I pull into a small camp ground early in the evening, 7:00pm, exhausted from the day's activities. My tent is up just meters from the primitive Bonneville hot springs. Most springs around here aren't commercialized like they are back home. The pools built from stacked river rock are all that's needed to reflect on life. Slept like a rock and didn't leave camp until 8:30am. The last meal dwindling in my stomach, I was anxious to get to Lowman for a good breakfast. A quick downhill ride along the highway put me in town by 10:30am. It's unfortunate that Lowman only has the one cafe. Both the service and the food were abysmal. I waited over an hour for cold biscuits and gravy, eggs, and home fries. But, food is food, so I ate what I could and shoved off by noon. The early afternoon was as uneventful as the morning was. The ride along paved highway made travel quick, and the river valley provided a stunning view the entire way. The unfortunate side effect of this combination was the close encounters with traffic. The mercury begins to rise. By the time I pull into Garden Valley at 2:30pm, it's topping 90 degrees. There's not much more to Garden Valley than a couple of houses. Another four miles on the highway would take me to Crouch and more services. But those I did not need, so I opted for a quick rest in the shade by the Payette River, watching local kids dive in from a bridge. What I could have used for the next haul, a 2000 foot gain over seven miles, was cooler temperatures. At 4:00pm I leave the highway for a death march up the gravel pass. This was, quite literally a march, as the last two miles stretched the limits of my gearing. 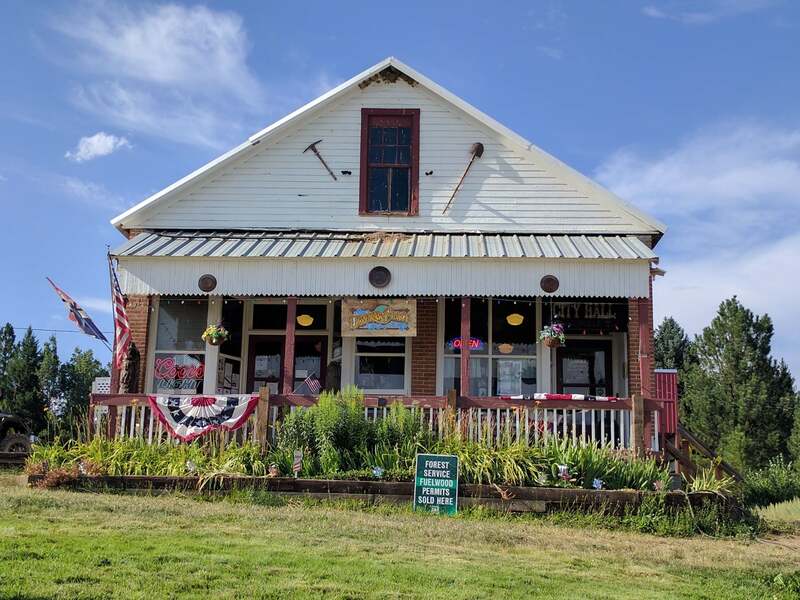 With all three water bottles depleted, I make a quick stop in Placerville, a small town of about 20 people, a museum, convenience store, and a wedding in the park. Electrolytes replenished, another small 1000 foot climb over three miles lies Idaho City. I was able to stay on the bike for this one, and arrive in Idaho City at 7:30pm. Gotta get some rest before that train comes back round the bend. 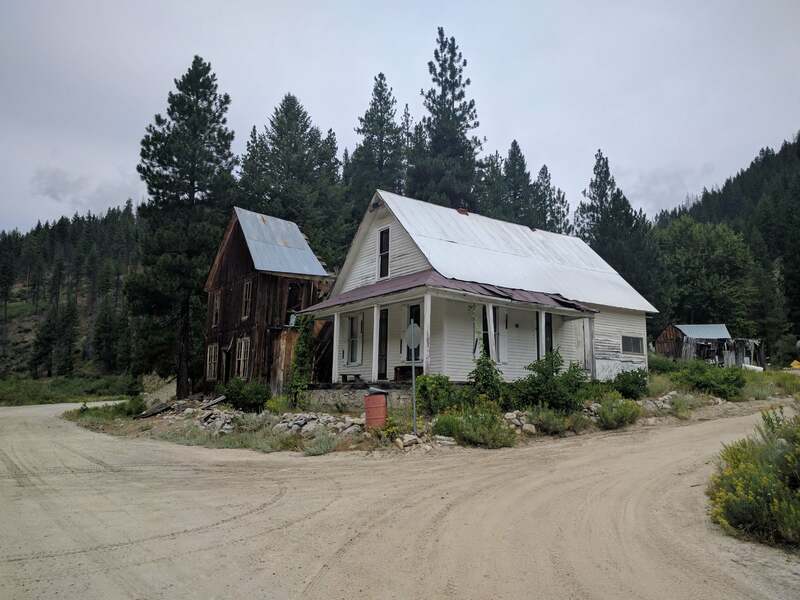 I cheated in Idaho City. Being the middle of my journey, I thought it fitting to get myself a hotel room, but with the primary hotel in town having no vacancy, I find myself in a suite above an ice cream shop. Initial excitement quickly turned to regret with the realization that the room wasn't equipped with a proper cooling system. It was nice to have a shower and laundered clothes, but the night would have been more comfortable out in the tent. A million miles from yesterday. In spite of yesterday's climbing, the past two days have been an overall deficit in elevation. Today begins the three big climbs on the return to Ketchum. So, it's only fitting that I begin with a much anticipated visit to Trudy's Cafe. 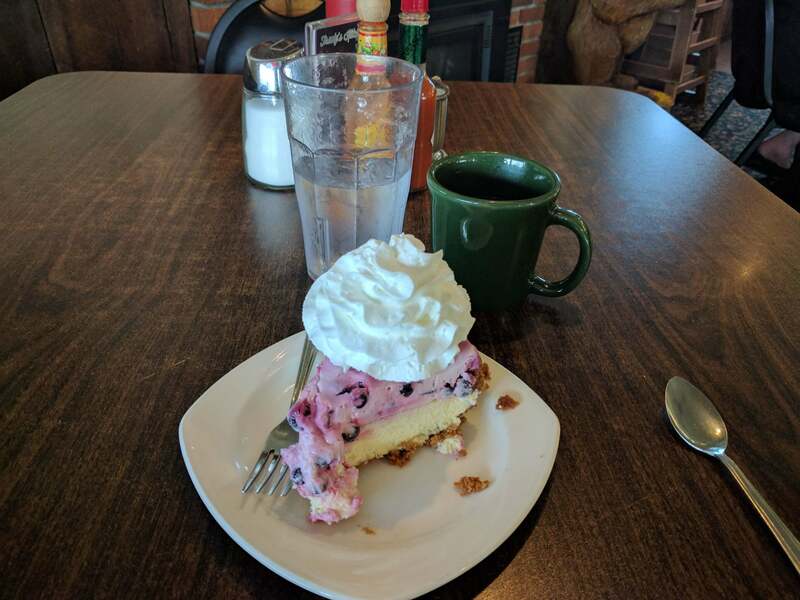 Trudy boasts “World Famous Huckleberry Cheesecake”, so I don't hesitate to request a slice after finishing a breakfast burrito. Needless to say, they do not lie. This cheesecake is amazing. It put an end to a slight headache from a couple drinks at the bar last night. I've gone crazy, couldn't you tell? There would be very few services from here on, so on to the grocery store to stock up on food and more sunscreen. The bug spray hadn't been used a single time, so it was trashed to free up extra space. Taking my sweet time, I was out of town late at 10:00am. The climb was immediate. There was no downhill for the next seventeen miles. But, at only 3000 feet gain, the grade was much calmer than yesterday. About halfway up, I end up taking a wrong turn and put in an extra mile or two before I caught the error and backtracked. There has been a decrease in the number of people around these parts, and an increase in the signs of wildlife. Near the top of the climb, I look down to see my tires roll over fresh bear prints! Bears are always exciting. Nothing quite gets your heart pumping like a close encounter with a big, fluffy monster. There aren't any grizzlies in these parts of Idaho, but there are plenty of larger black bear. The tracks that were sharing the same trail were moderately sized, but moving in the opposite direction. Apparently I had passed by him earlier in the morning? That's when I look up to see something even more surprising. Not 50 yards in front of me, fresh rodent hanging from his mouth, was what I only assume to be a rare Canadian lynx! Similar to the common bobcat, these can be identified by their longer hind legs and shorter stub tail. The experience is too short, as he dashes with his lunch into the thickets when he catches sight of me. Barely enough time to register what I just saw, not nearly enough time to snap a photo. Was it really a lynx? It could just as easily have been a bobcat. Either way, it was a unique and special experience. The climb paired itself with a quiet and serene descent. Quiet, except for my first mechanical failure of the trip. Halfway down, I hit what I thought was a manageable hole in the road, but it made my rear wheel immediately lock up. As I was skidding to a stop, thoughts raced through my head of the numerous things that could have broken that I couldn't easily fix with the tools at my disposal. Did my derailleur snap? Did my hub lock up? 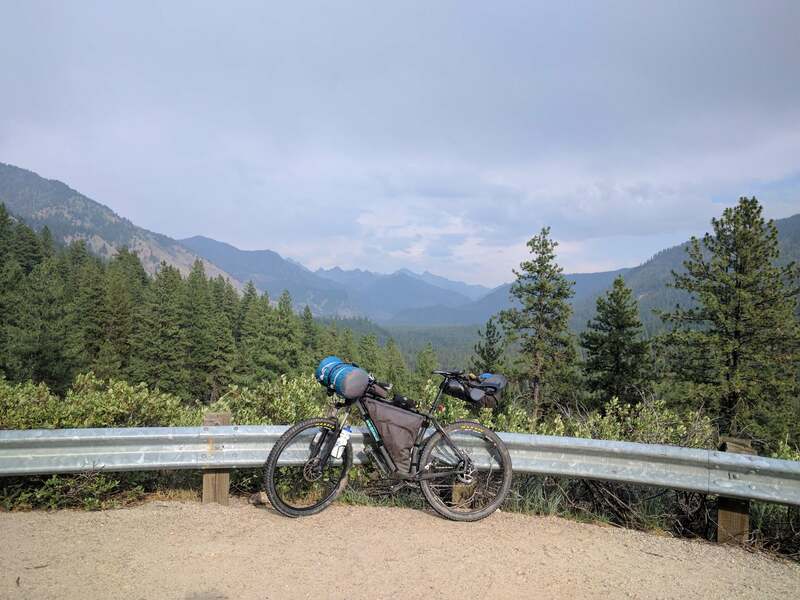 Would I be carrying sixty pounds of bike and gear for the remaining 150 miles? What was a catastrophic failure on a necessary piece of equipment turned out to be an easy fix with a little ingenuity. The saddle bag, a recent and expensive purchase, has suffered a tear in a critical connection point under the saddle snaps. This caused the entire bag to bounce low enough when I hit the hole that it caught the rear tire, jamming it between the frame. Friction from the tire also tore a small hole in the waterproof and supposedly durable material. Rope that I had on hand for storing food away from bears made for an easy solution that would last the remainder of the trip. Tied between the back of the bag and the saddle, it was now more stable than it had been before the failure. A tire patch then sealed the tear in the bag. Side note: REI returned the bag when I got back, no questions asked. One of the many reasons I continue to shop there. 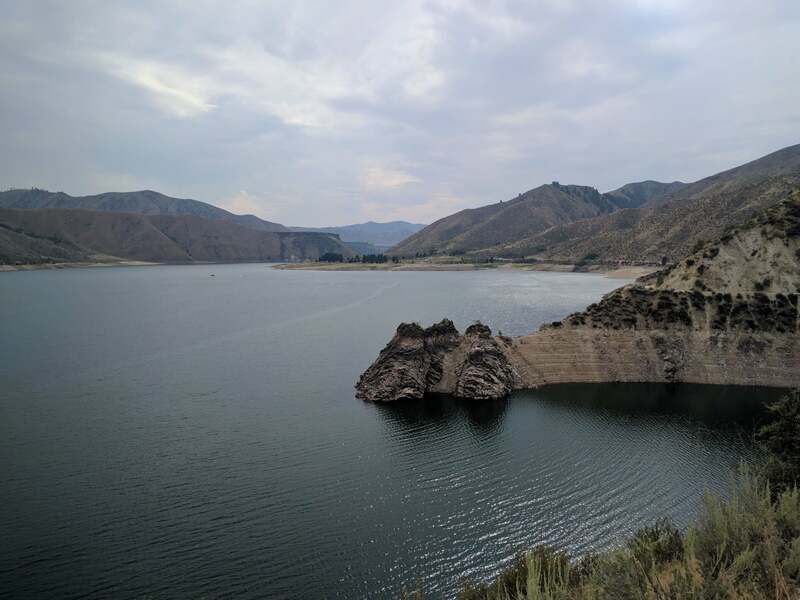 Twelve miles down to the Arrowrock Reservoir on the Boise river. This would put me within a couple hours ride of Boise, had I the ambition. No. I'll leave the big city for another day. That's not what I'm here for, anyway. Besides, there are enough remnants of the city on this part of the trail already. The reservoir is littered with garbage and debris from heartless weekend campers. I can't tell if silence is my foe or my friend. I spot a nice tent site several miles east of the reservoir at 7:30pm, and set up camp to escape the torrential rain that began later in the evening and lasted most of the night. Last night's rain ushered in the morning fog. Combined with the vast, impenetrable walls of granite made for an otherworldly experience. Temperatures were the lowest thus far, sticking in the low 50's until late afternoon. I began the second big ascent of the return at 7:00am. The first fifteen miles were uneventful and relatively flat. Then came Phifer creek; eight miles entirely of hike a bike, with 3000 foot gain over eight miles. At this point I began to rethink either my gearing or the amount of weight I was carrying. Perhaps next time I'll pack lighter or use a smaller front chain ring. I really don't mind walking, though. It keeps the heart rate down and allows for easier sightseeing, which there was plenty of. The rain certainly made this place pop. Wildflowers were blooming and shrubs once shriveled from drought were again vibrant with life. Featherville and the surrounding area exists primarily from earlier mining. Relics of dredge lines spotted the hillside and a small ghost town, Rocky Bar, provided a glimpse into times past. Take only pictures; Leave only footprints. Stand in the dark long enough, well, something's bound to shine. 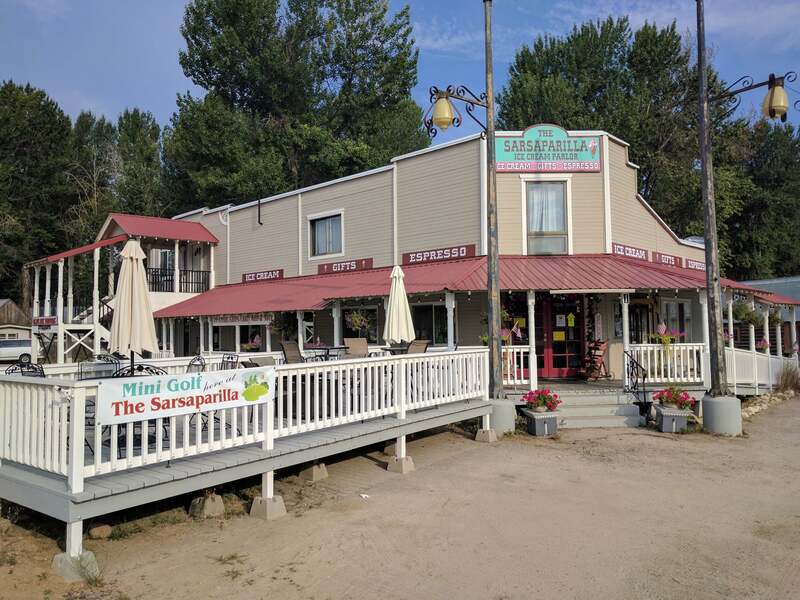 Already 2:00pm, I hadn't eaten a decent meal since Idaho City the morning before, so you can imagine my disappointment when I arrive to a closed Featherville Cafe. A sign hung in the window stated they would be out the rest of the day. I had been anxiously awaiting sinking my teeth into an overloaded sandwich. The neighboring bar was open, so I hoped for the best and headed in. The extremely friendly and welcoming bartender greeted me and informed me that no, they do not serve food in her establishment. But, she told me to sit down, handed me a beer, and called the town grocery store. A grocery store? Was she ordering me a gallon of milk and a Snickers bar? Apparently, the proprietor is also a capable pizza chef. More than capable. This man can make a mean pizza. 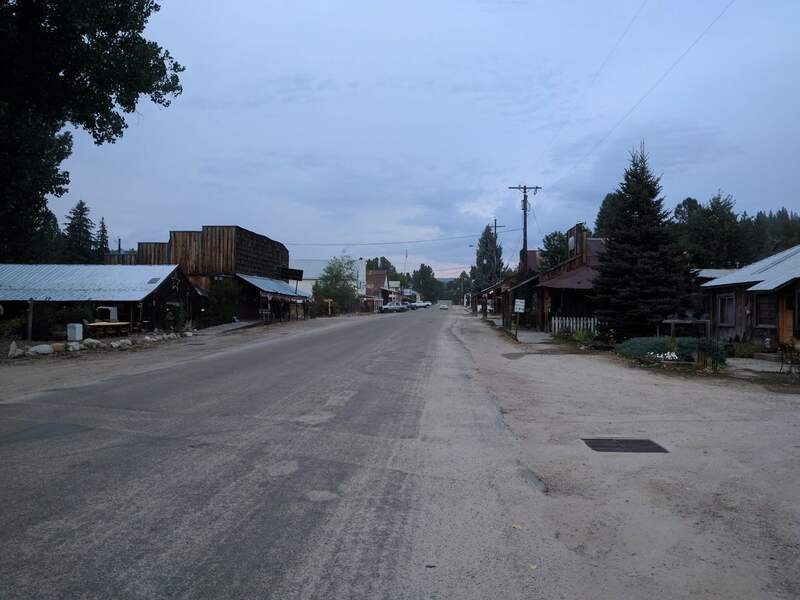 Sitting at that bar in Featherville, Idaho, listening to a couple locals catch up on Monday afternoon gossip, I polished off that entire twelve inch jalapeno popper pizza. It was one of the best pizzas I've eaten, and I couldn't have asked for a better place to eat it in. 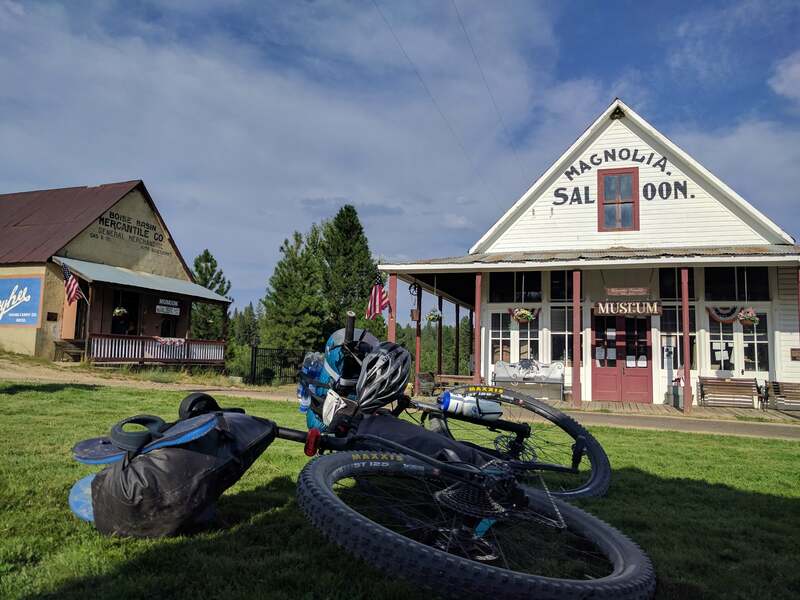 The town of Featherville is a major stop on most of the bikepacking routes in this area. The cafe actually has a bike hanging on the front porch to welcome weary travelers, most of whom continue east to Ketchum, like myself. The locals were quick to warn me about the road, which has been washed out for the past several years after a massive landslide. That was fine. I was on a bike, not in a car, and other people do this all the time. How difficult could it be? I was determined to make it to the other side of the landslide by nightfall, so I left town at 4:00pm. Lumbering right toward me. The same road we both shared. The same road so far away from civilization. He looked up at me. I'm deeply sorry for intruding on your space. I'd like to pass through here, please. The bear spray is out and at the ready. A sigh of relief as he bounds up the north hill and out of sight. My second close encounter with a black bear this year. If you maintain composure and treat them properly with respect, you'll both come out unscathed. But, that feeling in the pit of your stomach never quite goes away. It was already beginning to get dark out as the sun had dipped below the massive peaks. I knew staying anywhere near him wasn't the best idea, but I lucked out. A few miles up the road I ran across an abandoned Forest Service bathroom next to a day camping area that hasn't seen use since days before the landslide. It was just big enough to fit my bike, which housed all the smelly Larabars. Bears prefer non-GMO, vegan, dairy-free bars, right? 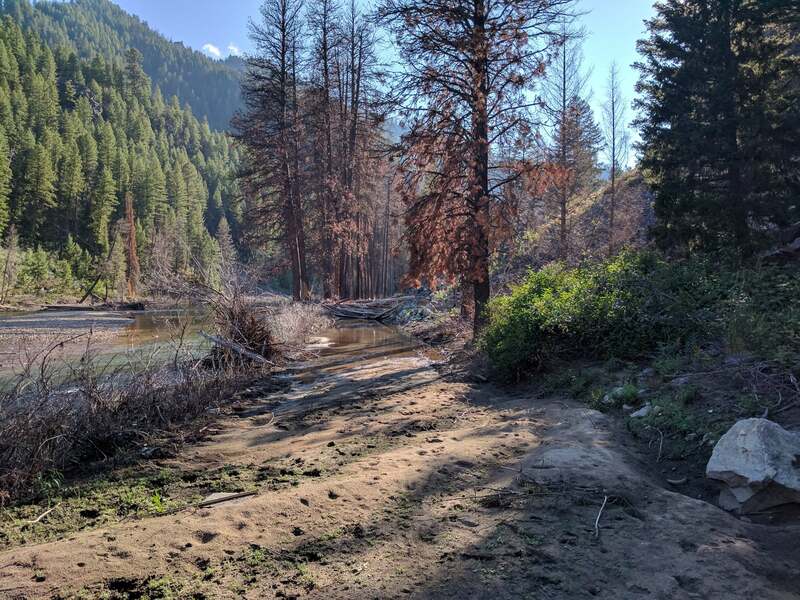 That night at 6:30pm, I pitched the tent in the sand next to the South Fork Boise River, bike and food safely in the confines of brick walls, and didn't sleep a wink. Up bright and early and back on the saddle by 7:00am, nervous from the lack of sleep and thought of another 26 miles of climbing. It's interesting to see how nature takes over what was once maintained by humans. For the most part, the road was still visible as a sandy line cut through a canopy of trees. I spent most of the morning dodging fallen rocks, climbing over trees, and fording the river, which had snaked its way several times over the road after years of erosion. One section, nearly a mile long, the river had replaced the road completely. Here, I was surprised to find a trail freshly pruned out through adjoining brush. It's as if someone had come through the day before to clear it just for me. Maybe it was in preparation for next month's Smoke and Fire? Whatever the reason, I'm thankful for the effort that person went through. Ten miles later and I'm back to a hint of civilization. Access points from the south and Soldier Mountain Ski Area bring in a trickle of campers. Smoky Bar Store catches me off guard, as I didn't expect any services way out here. Closed, but I didn't need it anyway. I would be in Ketchum, hopefully, by this evening. Slow down, you're on vacation. What I had expected to be one of the most difficult climbs, 3000 feet over fifteen miles to the highest elevation in the entire ACA Hot Springs route, turned out to be the most pleasant. Unlike the previous days, not once did I feel the need to get off and walk. Maybe my body had finally gotten used to the punishment. Near the lower part of the climb I had an incident that I'm laughing at myself over. The road went through some cattle grazing land. This is typical, as some farmers and ranchers still lease grazing permits from the Forest Service. Growing up on a cattle farm, I wasn't phased by the mother and calves on the road and chased them off to the side as I peddled by. But, not a minute later I hear stomping and “mahs” from behind me. The mother either saw me as enough of a threat to try to chase me off, or she was just friendly. Either way, I wasn't going to stick around to find out, so I pick up the pace. It's not hard to outrun a fat cow on a bike, even when going uphill. But, this one was relentless! She wasn't giving up. That mother chased me for over two miles, uphill, at a pace she probably shouldn't be going on flat ground. At one point I had even considered using the bear spray! I have never in my life seen a cow act that way before and am udderly perplexed by her behavior. I didn't fully consider myself in the clear from her wrath until I passed a cattle guard in the road several miles later. The final summit, Dollarhide, was beautiful. 360 degree views of the peaks and valleys of one of the most unique and underappreciated areas I have ever had the pleasure of experiencing. Twenty four miles of glorious downhill brought me back to the bike paths of Ketchum that I had left less than a week before. A week full of all the pains and pleasures that this part of Idaho could throw at me. Certainly a week I will never forget. I would do this ride again in a heartbeat. Threw stones at the stars and the whole sky fell.